Great mini straight waterpipe by HVY glass. 10" high, fumed foot, fumed rim, fumed body. Comes with a funnel shaped bowl and nicely diffused downstem. Great American glass at affordable prices! 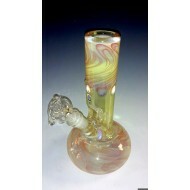 This fumed pipe will change colors as it gets dirtier!. Perfect size for the discreet consumer. 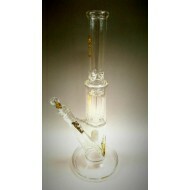 Docs Smokeshop has a great selection of HVY ( heavy) Glass. Heavy Glass is made in the South Bay area of Los Angeles, CA and we have been keeping our products “made in the USA” for over 10 years now. We love our small US based vendors and are proud to use their products to make our products. 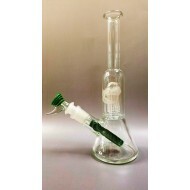 Buy Darby glass at Docs Smokeshop Darby Glass. Worked stem and slide. 2 chambers. Tree percs.&nbs..
Water Pipe by Crush. Available in Straight or Beaker Bottom. Crush Blue, Available as a straight tube or beaker. 14 mm. diffused down stem. Ice pinch. B..
Water Pipe with color Lip Wrap and Foot. Ice pinch. 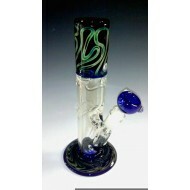 Slide with Handle.Standard 9 mil slide incl..
Water Pipe with color Lip Wrap and Foot. New Amsterdam Owl Bubbler. White lip wrap and foot. 2 Chamber. 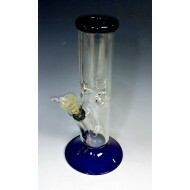 Blue accented Shower perc. 14 m..